Most of the people we met in Wyoming were from somewhere else. I’m not talking about the seasonal employees at the National Park’s visitor centers or the international students who work in the restaurants and gift shops. I’m talking about the people who call Jackson home. One of the paragliding instructors told us he’d been there about ten years. In addition to floating off mountains, he has a full time gig as a janitor. He said it was a great place to raise kids and he was there to stay. We met a waiter who’s been there for two years and is trying to launch a career as a photographer, not a super young guy, in his early thirties. His girlfriend followed him out and they got married. He said the town is a mecca for kids fresh out of college. They work for a couple of years and then move on – or not. 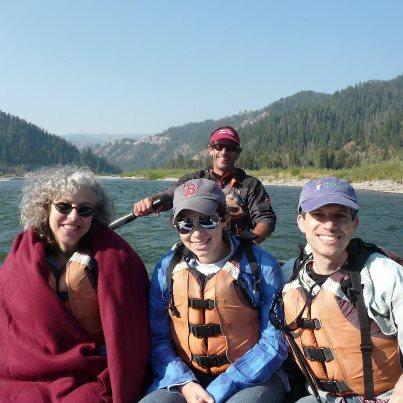 The most interesting transplant we met was John, our white water rafting guide with Barker-Ewing. John is originally from Connecticut, but has been living out west for fourteen years. He’s an outdoor adventurer who cobbles together a living leading rafting and kayaking trips down the Snake River and anywhere else you can float. He’s saving money for a trip to Ecuador where there’s a river waiting for him. I’m not sure what he does to earn money in the winter, but when the snow falls, he hits the slopes. John does a lot of what’s called back country skiing, or skiing out-of-bounds. That’s just what it sounds like, skiing where there are no trails; where if you break your neck they may not find you for a while, which is what happened to him. Luckily he had cell reception and was able to call for help. Another time, he got buried in an avalanche. He said it was like being in cement, he couldn’t breathe. Just as he started to see colored lights, indicating that his oxygen was almost gone, the friends he’d been skiing with were able to dig him out. He shared these stories with us while we were floating down the Snake River in an eight-person raft. He was entertaining, but I wondered if there were rafting-related misadventures that he was keeping to himself. I’d never gone rafting before and I’m not embarrassed to say that I was scared. This trip, however, began with a benign two-hour float, followed by a stop at their campsite for breakfast. The float was so beautiful and relaxing (although cold in the morning), and the breakfast was so delicious (rice flower pancakes, maple-flavored sausage, perfect coffee), that I figured I’d at least die happy when we hit the white water. There were two guys from Atlanta with us on the raft. One, also named Andrew (the spitting image of Robin Williams, don’t you agree?) had moved to Cheyenne for a job with an environmental firm a couple of years ago, and the other, his friend Dixon, a radiologist, was visiting him. When I found out we had a doctor on board I definitely relaxed. Can you tell which one looks like Robin Williams? As it turned out, Dixon’s services weren’t needed. The country’s been having a drought, and the Snake River was not in a raging kind of mood. Oh, there was white water, and we had our thrills and got wet, but it could have been much worse. Considering that we weren’t wearing helmets, it’s probably just as well. John had clearly had a lot of luck in his life; I didn’t want to be around when it ran out. 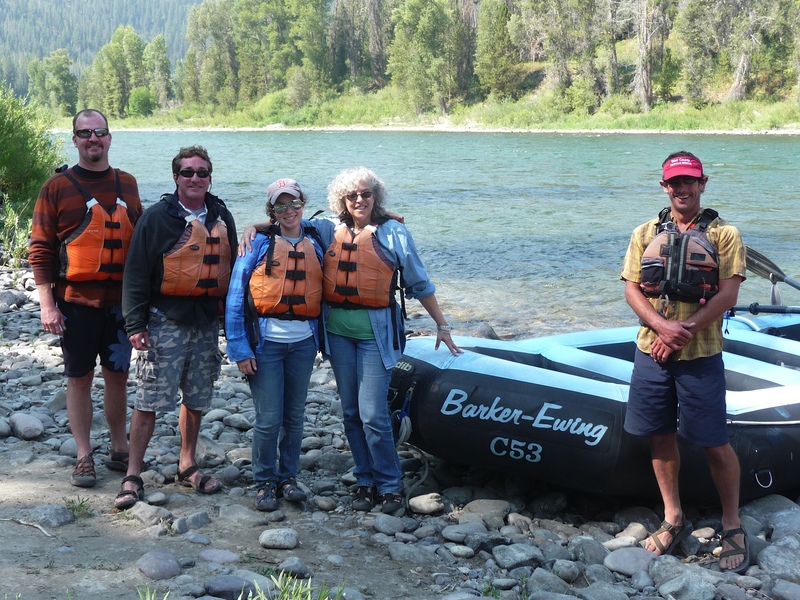 If you’re going to Wyoming and want to do some rafting, I’d recommend Barker-Ewing. But don’t confuse them with Barker-Ewing Float Trips. The only difference is the hyphen in the url that our outfit has. Apparently Barker and Ewing were together for many years. When they finally split up, the hyphen free crew decided to stick with lazy trips, floating tourists around and pointing out bald eagles and such. Our company got the hyphen and the franchise for the white water trips, and the campsite where they serve their incredible breakfasts. This entry was posted in Uncategorized and tagged Jackson, Robin Williams, Snake River, white water rafting, Wyoming. Bookmark the permalink.